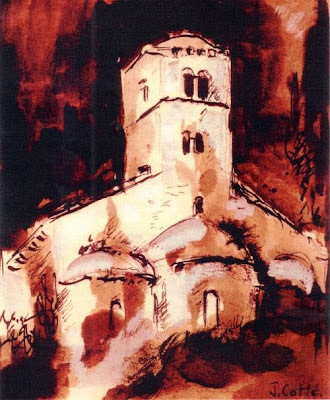 This sketch shows the Chapelle de la Madelène outside Bedoin in Provence. The earliest parts of the chapel date from the 11th century. In 1970 a Benedictine community of monks was established in the grounds of the chapel. As the community grew in numbers it went on to build the magnificent L'Abbaye Sainte-Madeleine five miles away at Le Barroux. The new monastery, which was consecrated in 1979, occupies a 75 acre site. It is built in a mock-Romanesque style and takes its visual cues from the chapel at Bedoin where the community was founded. Mock-Romanesque was not the most adventurous architectural style to adopt, particularly when the Benedictines at La Tourette to the north had retained none other than Le Corbusier and Iannis Xenakis to create their new monastery. But the conservative aesthetics of their new monastery are in line with the traditionalist views of the community at Le Barroux - let's not forget this is the religion that brought us Ferdinand and Isabella. I can personally vouch that L'Abbaye Sainte-Madeleine is a very inspiring building both to stay in (the inauthentic under-floor heating is a welcome feature in winter) and to hear the Holy Offices sung in incomparable Gregorian Chant. And at least it hasn't suffered the fate of this contemporary Catholic building. The use of visual cues can be seen in my montage below, which show the east ends of the two churches. On the left is the 11th century chapel at Bedoin, to the right is the late 20th century Abbey that it inspired. Bedoin and Le Barroux are located approximately 30 miles outside Avignon. From 1309 to 1377 Avignon was the seat of a dissident Papacy, and the city flourished as a cultural centre during that time. The school of composers associated with Papal Avignon is known as the late fourteenth-century avant-garde. Names such as Johannes de Meruco and Jehan Vaillant are largely forgotten today. But they are remembered on David Munrow's magnificent survey of the music of the period The Art of Courtly Love. Improvisation and embellishment were integral features of David Munrow's music making. They also feature in the work of another early music ensemble that has provided me with some very rewarding listening in recent months. Millenarium has already featured here with its compelling CD of music from the Llibre Vermell. Since its formation in 1999, the ensemble has set out to interpret music of the Middle Ages in a modern and creative manner, just as the monks at Le Barroux creatively interpreted the Romanesque style in their new monastery. 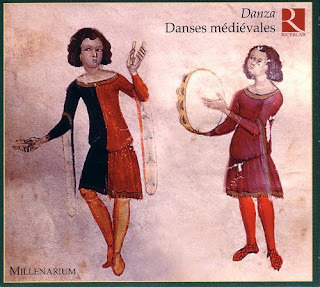 On their latest CD Danza for the Franco/Belgium Ricecar label, Millenarium has built on the 14th century Italian dance style to develop a programme that unashamedly mixes their own improvisations with original material from the Middle Ages. The period instruments used are organetto, percussion, fiddle, viol, citole, transverse flute and harp. In the mix, hints of Middle Eastern music and even jazz blend comfortably with early music. Danza is one of the most refreshing early music releases I have heard for a long time. But it is also new music. So, bring on the medieval avant-garde. Or turn things on their head, and bring on the 21st century avant garde in a nearby medieval monastery.